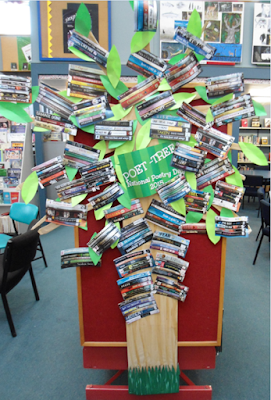 Here's a fabulous twist on the Poet-Tree idea from Sarah at Ashburton College. Through the week their students had lots of fun creating 'spine poetry'. The resulting 'poems' were photocopied and used to ‘foliate’ the tree. Love it! Thanks for sharing Sarah.